Boiled Custard was something I never heard of until I moved to the South. Up until that time, when someone called a dish “custard,” I thought of either a baked dessert that is set (like flan) or the cooked and slightly thick base for ice cream. Boiled Custard, as I soon discovered, was served as a drinkable (or it can be eaten with a spoon) dessert during the holidays. It’s often paired with another dessert, such as pecan or pumpkin pie or pound cake and the two really complement each other, especially when you can’t decide on which dessert to choose. While Boiled Custard is an old-fashioned holiday favorite, we think it’s so tasty that it should be revisited. After all, the holidays are the perfect time to pull out those dusty old recipe cards and prepare dishes that you grew up with that were family favorites. The 8-minute cooking time is spot on; be sure to keep the water on simmer (not boiling) in your double boiler and whisk the mixture constantly to keep the temperature even while it’s cooking. As you probably know, when cooking anything with eggs, if the temperature gets too hot, you may end up with scrambled eggs and that’s not what we want for dessert. 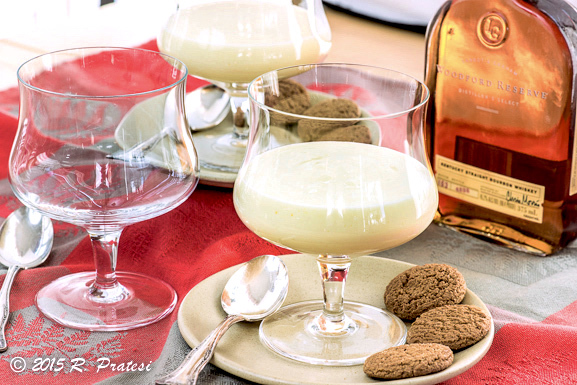 Think eggnog meets pudding and you will understand the texture of this custard. The only change we made to the recipe was to elevate the flavor with Bourbon Barrel Food’s Bourbon-Madagascar Vanilla Extract in place of regular vanilla extract. 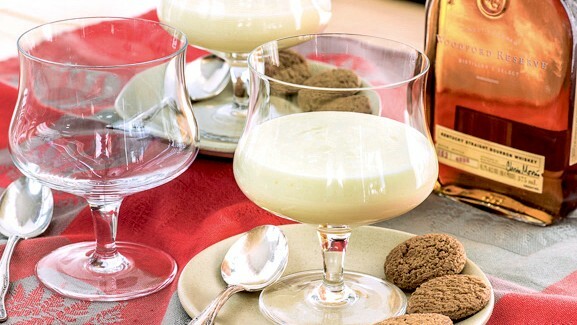 And boozy dessert lovers (like us) enjoyed a little bourbon stirred in, which gave it that eggnog flavor and thinned the texture just slightly to make it more like a drink. 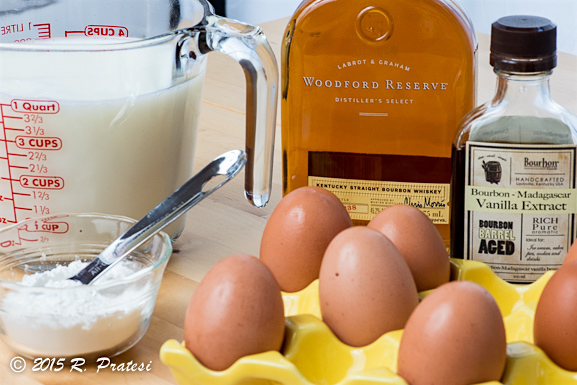 Just a warning – it’s so good with the bourbon, you might become addicted, so you may want to make a double recipe, especially if you have a house full of guests. You’ll also find that kids inhale this stuff, so be prepared. If you haven’t been introduced to Boiled Custard in the past, it’s sure to become a new favorite in your home during the holidays. You can serve this dessert alone or with other desserts such as pies or cake. You will be able to serve more people if it’s served along with something else or if you mix it with a little bourbon. The custard will hold for a few days, so you might want to make a double batch and store it in a glass container in the refrigerator. You will find that it disappears quickly, especially when guests are in the house, so be prepared this holiday season. 1. Beat eggs and sugar together in a large bowl until the mixture is smooth and pale yellow. Add the salt. 2. Heat milk in a large double boiler until it steams. Gradually add in a very small amount of the egg and sugar mixture to temper the milk, whisking constantly. Continue to add the egg and sugar mixture, a little at a time, while whisking. Then whisk in the cornstarch. Cook mixture slowly over simmering water, whisking constantly, for about 8 minutes. 3. Remove immediately from the heat and strain through a mesh sieve into a clean bowl. Whisk in vanilla. Cover and chill until ready to serve. I’m making this – drinkable desserts are my fave 🙂 Happy Thanksgiving to you and Roger! 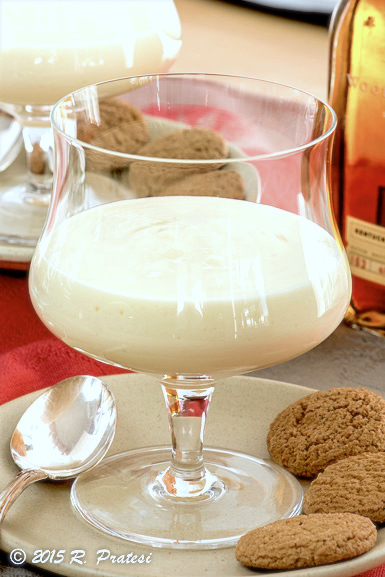 Drinkable desserts are perfect for the holidays, especially with a nip of bourbon. 😉 I hope you and Don have a wonderful Thanksgiving, too! Cheers! No need for cornstarch. Cook it a couple minutes longer and it is as thick as one would want it. Glad to see this wonderful drink being brought back! Our 6th Anniversary and a Big Announcement!